This recent Kill Screen review of Dishonored earned its fair share of criticism, and rightly so - the review reads more like a rant than a well-reasoned criticism of the game, but I am no expert on the matter. I rarely review games, partially because I have a sneaking suspicion my comments are suddenly less compelling when numbers are attached. Instead, I prefer to explore ideas and their executions in more free-form and isolated situations, which is exactly what I want to do here. The reason I mention the review at all is because the author specifically calls out Dishonored for its array of choices which, as he states, feel absolutely meaningless. As the article tag-line states, "Dishonored lets you do whatever you damn well please. Why?" Could it be that the glut of choices makes each of them trivial? For awhile, I actually thought this was true. For those unaware, Dishonored is a stealth-action game, or rather, it is a stealth game and an action game - and a few other things as well. 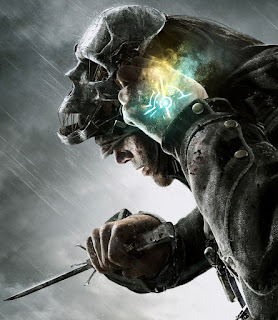 Corvo, the game's protagonist, can approach his assassination missions with a huge array of variability. He can use his Blink ability to teleport along the rooftop, out of sight from the watchful guards, or he can lurk in the shadowy sub-basements to reach his target, or he can leap into action and stab everything that moves, or summon rats, or possess fish, etc. etc. etc. It can all feel quite overwhelming. Here is how I played the game for the first two hours: First I tried being stealthy, maintaining a height advantage over my enemies and sneaking up to guards. Then, time and again, I failed miserably. I would blink off the side of a building and land on top of a guard, or move out of the shadows and bump into a roaming NPC. In response, I would panic, kill anyone in the immediate vicinity, and then run back in the shadows. Frankly, it was boring and disheartening. Then I learned how to play. Today I went through The Royal Physician campaign twice with two self-imposed conditions. In my first attempt, I would avoid touching the ground whenever possible. Functionally, the floor was lava. In my second attempt, I would kill...everyone (I know, I'm a terrible person). Both experiences were viable and incredibly entertaining, mostly because the I established the limitations myself and I was able to handle the job efficiently. Play became an artful form of practice. The pathways left unexplored were intentionally abandoned. I felt more like an artist choosing her color palate rather than a tactician in battle. My perspective changed from when I first stepped into Dishonored. I abolished the sense of triviality in the face of so many options by measuring my ability, learning, and, most importantly, choosing to find meaning on my own terms. Sometimes you have to work for your enjoyment. This reminds me of people who criticized Banjo-Kazooie for having a character who just had too many abilities, a game which is close to 15 years old now. There's some truth there: lots of character abilities can be a lazy way to recycle the same obstacles. Jump over a pit, then long-jump over a pit, then fly over a pit, etc. Or instead of mastering an ability, you simply select whatever ability solves whatever problem you have in front of you. It's also a little more difficult and interesting to design fewer but deeper abilities (compare Mario 64 to Banjo-Kazooie). But like you said, a variety of abilities also give players more ways to interact with the system of a video game, explore its many nuances, or, more simply, to play. I think some people, at times, just don't want to "play" and want a more focused challenge. A system to master rather than simply manipulate. There's nothing wrong with that - it's the difference between XCOM and The Sims - but sometimes I think critics respond poorly to games because they just aren't in the mood for it within the deadline of their review. That's not necessarily the best criticism but I also don't think it's that terrible. Maybe it's not fair to pick on Dishonered like this review does, but maybe Dishonered is still illustrative of the problems the reviewer sees in games. alright, I’m still working on Borderlands 2. Absolutely well said. I think the important point here is that every now and then, when a game isn't exactly what a player wants, they should try to enjoy it anyway. Can you try to force yourself to enjoy a game, or force yourself to look harder at what makes a game special, even if you know right away that it is not the style for you? Some games really do take an effort. Of course this is no more true than for reviewers. from the player. The games that didn’t were more like disposable entertainment.